Predictions today are that GUSTAV will go in as a CAT 4 just west of New Orleans - if so they will get the absolute worst of the killing storm surge. Clear Lake is like glass this morning – hardly a ripple. It’s not often that the water looks like a silver mirror. 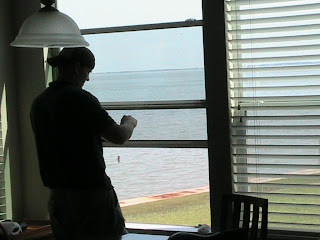 Yesterday one of our crew was installing our Clear security film (it screens out 99% of cancer-causing UV) on the windows of a house overlooking Galveston Bay (first photo). 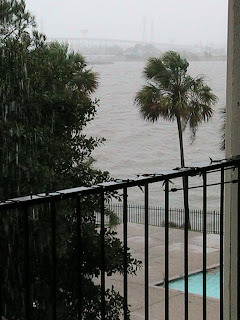 We’ll see what these scenes look like after GUSTAV has his way with those of us living on the Gulf coast. Two cities called me Thursday, wanting to meet Friday. I told that was impossible--will do it next week. Then Channel 11 called at one point yesterday, looking for a place downtown where they could see the security film in action. The closest one I knew of was the building Armor Glass did for the University of Houston (their Emergency Ops building) – which they thought was too far to go. LOL. Channel 11 mentioned the Metro building – but I was informed by people who know that the film purchased for Metro and IAH airport was NOT Miami-Dade certified! In other words, the non-certified film that was put on the airport (and Metro) to protect from glass shrapnel has not passed the official hurricane performance test and very well could fail next week -- and could well result in injuries that would not happen if it had been Miami-Dade certified material. In short, someone took advantage of the city and gave them the illusion of security by using cheap, uncertified material. I blame the contractors, not the city, for that. Why pay tons of money for something that could fail to protect as intended? That is why the film was applied to Metro and the airport - to protect people! It could fail in GUSTAV. My Armor Glass company refuses to sell any material that is not Miami-Dade certified. My condo has it on the doors – IF it is still in existence after GUSTAV. I can see why the 1900 Galveston hurricane killed thousands. 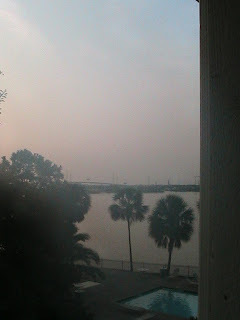 Looking out my window now overlooking Clear Lake -- and the bridge to Galveston Bay -- all I see is bright friendly sun and flat, calm water. There is absolutely no hint that a killer is coming our way in less than 3 days. Without a satellite to give warning, we’d be sitting ducks just like the citizens in Galveston going about their business in 1900 without a clue that in hours over 6,000 of them would drown. So would today’s citizens without that technology to warn us. Yet our leadership actually has jeopardized this vital early warning system by failing to get new weather satellites in position BEFORE the old ones fail, which have a predictable life span. What kind of priority is that? We are close to losing our vital 'eyes in the sky' protecting us. Again, it is a failure to think ahead! Good leadership would not delay funding something so vital to the lives of millions of people living near the American Gulf and East coasts that are suddenly facing multiple storms popping up in the Atlantic. But they have failed to do exactly that with something as fundamental as weather satellites. What kind of thinking is that? And when the Weather Director complained about it, HE was sacked! Crazy. Firing a person who thought Americans should have the latest technology protecting them from a killer storm BEFORE the old one fails. We’ve got a two-fisted punch coming, from both Gustav AND Hanna. Stay tuned. If our leaders don’t keep our “eyes in the sky” we’d be going into this BLIND. As it is, even with warning, there are thousands in places like New Orleans without a car or way to escape GUSTAV, who could be a monster by the time it hits. The good news is that this may be the “wake up” call the coastal communities need to upgrade building codes. Already, Galveston County requires that hurricane glass is used for any window that is replaced. That will be expensive – they cost over 4 times what it takes to put on our film. And our film will also be cutting energy and cancer-causing UV rays that the other doesn’t. Mine on m condo on Clear Lake is about to get the ultimate test – if predictions hold true and the storm is coming closer to Houston. Gustav could be another Katrina if it hit CAT 3, which appears highly possible. Stay tuned - from the front lines here on the Texas coast. Just when I thought we might be getting lucky and getting through the middle of hurricane season without much threat, GUSTAV sprang up. it's been rolling down the "slot" -- just south of Cuba -- a track that usually puts a storm into the opening of the Gulf of Mexico. If it slips into the Gulf of Mexico "bowling alley" the next few days, then Texas and Louisiana are sitting ducks as the "pins" for it to roll up against and punch us HARD like Rita and/or Katrina did in 2005. It could be a major blow whose track will take a lot of Gulf oil platforms off-line, which will cause a spike in gas prices at the minimum. I recently found out (from a NASA friend who is still working there) that the NASA Procedure for dealing with a hurricane. It is to "put a garbage bag over the computer in any office that has a window." No kidding. It's not exactly 21st Century technology or preparedness, but I've been working on ways to get them to think about protecting their people and hard assets on the ground from earthly threats, not just those encountered while flying in space. Meanwhile, too many houses on the Texas coast are sitting ducks without real protection. Stay tuned as GUSTAV draw near to see what happens. This could be ugly, and another wake-up call to get our building codes upgraded and buildings protected with Armor Glass Miami-Dade certified security film! A couple nights ago I was invited by the kind folks at Huber Optik to join them for the 172nd birthday party for Houston at the GR Brown. For some reason I didn't see anything in the media about it. The first person I bumped into was the very nice Council woman Anne Clutterbuck. Then I bumped into Mayor White. I told him that it was great to have a really GREEN Mayor. I meant it. He seemed pleased by that. I like having a leader with a green drive - save energy, do things more efficiently. We completed our first building at the University of Houston, making their Emergency Ops building more secure. We are also finishing up the John Manlove Communications building with our Solar Security film. In the latter, when the sun was out our installer held a BTU meter next to the window - the sun was Hot and the meter was hitting 100 to 111 BTU's. When the Solar Security film was put behind it, the BTU reading dropped to 30 or below. There are photos on the Armor Glass website. That means that our film is cutting 2/3's of the heat from the building, which has to cut energy costs. The film will eventually pay for itself, unlike most other things that go on buildings that I am aware of. I agree with the Mayor that we need to improve our building codes. I hope the next Mayor will be as "Green" as Mayor White has been(even if the name is Brown). Ok, it's a pun, since one of the candidates is Peter Brown. lol. I have been traveling almost constantly. Anything is possible. Next President Needs GLOBAL Strategy for the U.S.
America back in the economic/technological winner's circle? any troops in places like Afghanistan). even-handed justice and fair play. In a global economy it makes no sense to have only a "national"
human history to buy energy – over $700 billion/year. downturn. If one tire has a flat, the entire car has a problem. paybacks. We've done nothing. Will that be the next four years? been lost in our financial and technology leadership. America in the next four years to get us there? unnecessary confrontation that brings more pain than gain. turned back by the Russians). the revenge he sought. Oil has given him the money to do it. our President in the years ahead. Moral: Strategy (and policy) counts. Olympic pro. We have enough smart people to do it, if we just did it. will not be a head banging, off-road experience. In between traveling almost constantly, I was able to catch the Olympics in China. I didn't hear anyone say it but the Chinese are doing what America used to do -- put on a good show. Apparently the mastermind decided he didn't like the color of a costume two days before the opening and wanted to see a green one. He liked it and in two days they produced 2007 more just like it. Imagine that happening here? The management decision would have taken weeks alone! GM couldn't manage to see the rise in gas prices - despite paying executives millions of dollars to do nothing but think of these types of things. What else are they paid for? And Russia's invasion of Georgia - no one seemed to "get" it that this is how the other side of unilateralism looks like. We look two-faced to say that it was OK for us to invade Iraq on faulty evidence, that is was OK for us to recognize Kosovo breaking off from Serbia, but that is isn't OK for Russia to do the same regarding Georgia's breakaway province. We have undermined our own moral authority on this issue, unfortunately. And finally, I read that Mr. McCain has missed 8 votes on renewing the tax breaks that encourage wind and solar development - alternatives we need to get away from the oil sheiks that are part of the 70% of our oil needs that we import every day. Where is the common sense in this? I agree that we need more than to check our tire pressure but I don't see real leadership that promotes energy independence that weans us off unstable Middle East oil. Or maybe you just love giving $700 billion/year, as T. Boone Pickens says, "the largest transfer of wealth in human history" to people who don't like us. Is this leadership? Both candidates need to tell American BEFORE November what their energy and economic plans are - not what they did in Vietnam 30 years ago or in Chicago. We need a national plan that has some meat on its bones. We need both new sources, new drilling, wind, solar AND conservation. Hate to say it, but Paris Hilton is right - we need all these things, not just one or two. The Presidential candidates can start by VOTING first thing after the August break to give America a LONG-TERM strategy -that means tax benefits like in Germany that run for long periods of time, not just a year or two. Business can't plan on big projects when they don't know if the tax incentives will be around for long enough to make the investment - or pulled out from under them 5 years down the road. So far, I have not seen the dynamic leadership with a strong energy and economic plan that makes us less dependent on Iran's Mullahs, Venezuela's Chavez, big oil or the Saudis. That does not bode well for us regardless of who is elected. Let's put the candidates on the spot to come up with some real solutions to America's need for energy and economic vitality. Not even the third party candidates are worth listening to. We have to do better - or face another 4 years of America sliding further behind the growing wealth and power of places like China and Russia. Our future security depends on it. That is the read I get from recent events that Americans should be paying attention to - it's your future at stake also. The first photo is one a lawyer friend sent me, showing the 'damage' from Edouard..LOL. The second photo is how it looks outside my window the day after EDOUARD. We were supposedly in the "worst" of it - which wasn't much. We can't count on getting lucky like this the next time. 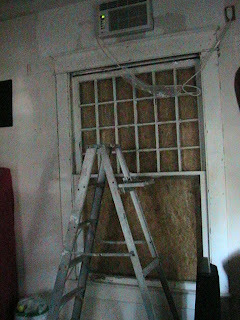 Because there will be a next time and people are still NOT prepared...I was - with our Armor Glass security film. It is the best protection when 99% of the people have ZERO. Get prepared now while you can. Because its too late when the next storm brews up. TS Edouard is a Dud. We got lucky. Many people were unprepared - they didn't even bother putting up plywood. Had Edouard intensified into a Cat 1-2, the damage would have been substantial. It proves again why it makes more sense to use permanent security film to protect windows than relying on putting up-taking down-putting up Plywood. Most people this time simply didn't bother doing it. When we do get hit by a "Big One" the wind-borne debris hitting their unprotected windows will result in structural failures and injuries that could have easily been avoided with our safety/solar film. 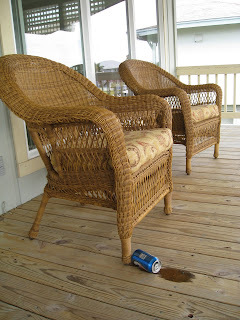 In fact, it was a freak storm with high-speed winds a couple of days BEFORE Edouard that was tossing my balcony furniture towards my sliding glass doors. The winds came from nowhere, from a strange front that moved in the opposite direction of our usual fronts. Had I not jumped, the furniture would have hit the windows. If I had normal windows without security film, the apartment and my computers, papers, etc. would have been damaged by glass, water and wind. But if it had hit, the glass would have cracked but the security film would have kept it from breaching into the space. We would still be high and dry - with film between us inside and the broken glass. The difference between plywood and our Armor Glass'plastic' film is the difference between a Model T and a Prius. Last night we had a precursor to Edouard. Storms rolled in from the EAST (the reverse of normal) and pounded us hard, once in the early morning, then big time about 8 pm. The winds almost swept everything off the balcony. In the middle of a wild week last week, I got a call that turned out to be from BBC (London) -- they wanted to do an update story on anthrax after Dr. Ivins committed suicide before being indicted. Apparently they found my Fox 26 piece on anthrax from 2001. So I ended up going by two radio stations to tape a couple minutes for the BBC radio news. I have no clue where it is on the Internet. Is this the end of the Anthrax killer? Maybe that one, but in the meantime we've created a bigger threat - over 14,000 people with access to weapons grade anthrax, in our own labs! I thought it was really clever how Mr. Rice came up with the terms: "Plastic instead of Plywood" as a title. I had never seen it put that way before, but it was descriptive. It's a specialty polyvinyl basically, but it boils down to high-tech plastic replacing outmoded plywood. It's like moving up from a Model T to a Prius. So, here is a picture of the alternative - It is a photo looking through a glass door which has our window film replacing shutters and plywood...at the University of Houston.